The Soyabella SB-130 Soymilk Maker is a smart and easy way to prepare fresh soymilk and variety of other delicious dishes at home. Just add water and soybeans to the soymilk maker and you get fresh soymilk within a few minutes. 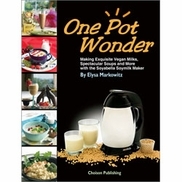 Makes tasty raw nuts' milk in as quick as 30 seconds. 1 quart of fresh soymilk can be made with just 1/3 cup of soybeans. Dry or soaked ingredients work best with higher yields. Capable of grinding grains and dried beans to a smooth and rich texture due to its helical shape grinding blade. Water heater built in water chamber ensures safety and ease of cleaning. With included accessories, dry grinding is also possible. Multi-operation microprocessor control gives perfect performance every time. Advanced safety equipment prevents overflows and dry-heating to make usage reliable and safe. Easy to clean brushed stainless-steel chamber. Soyabella SB-130 is a convenient way for preparing milk from a variety of beans and also for preparing fresh rice pasta, rice milk, porridge, and sesame paste. It can also be used as a coffee grinder using included accessories. 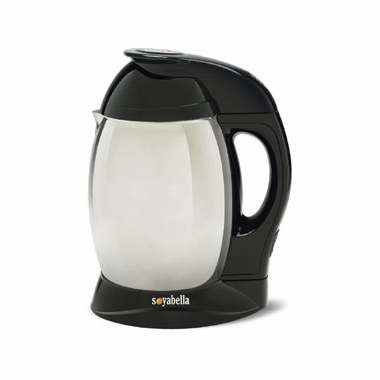 The Soyabella SB-130 Soymilk Maker is very easy and convenient to clean. For raw-food lovers, the Soyabella SB-130 makes delicious raw cashew milk, raw nuts' milk, and raw almond milk in as quick as half-a-minute! Soyabella SB-130 features a heating element safely hidden inside its boiling chamber made with stainless steel for added safety and reliability. Soyabella's advanced safety equipment also prevents dry heating, overheating, and overflows ensuring higher safety and reliability of operation. Soyabella's sleek shape and contemporary design give it a stunning look and makes any kitchen look more beautiful. Its compact size fits in small spaces and saves on kitchen space.